Day Four of American Mosaic | NJNA is Blogging! I should write this tomorrow when I am not so exhausted. But I just spent an hour getting my threads under control and into labeled baggies. My piece is a work in progress if you are optimistic. At best it is ready and waiting to be straighten out and understood, but I am a negligent parent throwing up my arms. 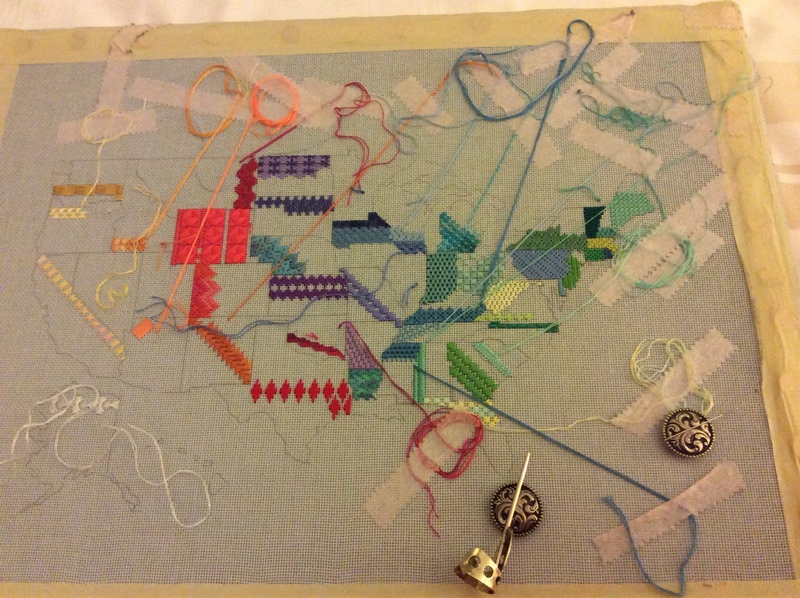 I know I will enjoy many happy hours of stitching on this piece,once I get home to my stitching chair and light. I learned and laughed in this class. I look forward to working on it and I was given clear instructions on what we didn't cover, such as the doodad stitch for Hawaii. We did cover all but three states, which we can figure out. I relaxed with dinner out with the gals. Tomorrow I have the Frank Lloyd Wright tour, which should be fun. Here is a picture of my messy canvas so far.